Firing is essential in pottery. Heat is applied to a raw clay piece that has been glazed. Firing sets the glaze and hardens the clay to create a piece that can hold up to daily use. The temperature at which a piece is fired varies with the choice of high fire or low fire techniques. The potter must understand the difference between the firing techniques in order to create the best pottery piece possible. Pottery is fired in a kiln at temperatures measured in cones. Low firing is performed at cone temperatures up to four or six. High fire is high-temperature firing at cone ranges from six to 10. Cone temperatures over 10 are reserved for firing glass and overglazed Chinese art. In ceramic and clay pottery, cone 10 and higher lowers the strength of the piece. Each glazed piece must be fired appropriately. Low fire is preferred for pottery that is brightly colored or with intricate designs. The low firing temperature allows the glaze to lay over the pottery without obscuring the design. High fire is used in pieces that are not intricately designed or colorful. In fact, the high-fire technique may add spots to the pottery, as the glaze speckles in the high heat. The glaze runs, smearing the design, but fusing to the piece for better waterproofing. Low- and high-fire techniques affect vitrification. Pottery vitrifies when the heat is very high. It hardens, becoming tighter and stronger as a result. Low fire does not encourage complete vitrification. The result is pottery that is not as strong as high-fired pieces. The pieces are not completely fused, making intricate pieces more fragile. High fire allows for full fusing of all pieces, complete hardening and a glass-like finish. Potters use the two firing techniques to create different qualities in the finished pottery. The type of material and its intended use are considered before the potter undertakes the firing. 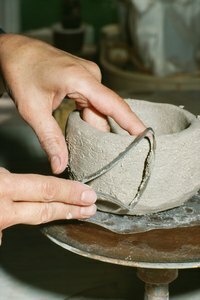 Clay and other earthenware materials work best in low fire, while porcelain, ceramics and stoneware react perfectly with high-fire technique. Big Ceramic Store: How Do I Get Started in Ceramics?